Why is it so important to me? Because it’s invaluable for one of my latest works in progress, which is set on the island of Corsica in the 18th century. And yet it almost slipped from my grasp. Historical novelists are always under pressure to get their facts right. However, it can be very difficult sometimes to find out what life was like in certain places in times past. When I wrote The House at Zaronza, my credibility was salvaged by various books. They told me about life on Corsica in the early 20th century and about nursing at the Western Front in World War I from the French point of view. Moving back into the 18th century, the sources about how people actually lived become even more remote. 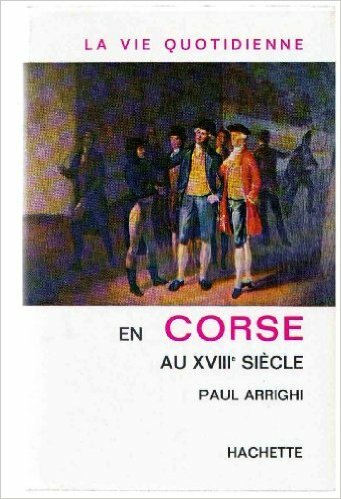 You can find out plenty about Corsican political history. This was a century of great upheaval when the Corsicans rebelled against their Genoese masters. They even elected an obscure adventurer, Theodor von Neuhoff, as their king for a few months until he had to flee, having failed to produce the international backing he had promised. A short-lived republic under the visionary Pasquale di Paoli was defeated in 1769 by the French, to whom the Genoese had effectively sold the island the previous year. Corsica has been part of France ever since. When it concerns social history, however, fewer sources exist, except in obscure journals – some of them in Corsican. My novel is about ordinary people swept up in these events, but I need to know how they were educated, what they believed, what they ate, what their courtship and marriage customs were, how local government and the justice system were organised, and a host of other things. That’s why this book matters so much to me . Thanks to the vagaries of La Poste, I almost never received it. It took far too long to arrive, so I contacted the seller. They found it in their local sorting office with the address label obscured by heavy rain, apparently. I hope La Poste compensated them in some way for the inconvenience. In the meantime, I am itching to delve into the book. And I’m willing to bet that it will save me and my novel from some howlers. This entry was posted in Corsica, Historical Fiction, Novels and tagged 18th-century Corsica, Corsica, Corsican Republic, everyday life in Corsica, historical fiction, historical novel, historical research, The House at Zaronza by nessafrance. Bookmark the permalink. The story of a book that is essential for my historical research – and how the only available copy almost failed to arrive.